When I buy a piece of hardware I generally use it until it becomes completely non-functional. Because of this, my old Sager laptop I bought five years ago was finally needing an upgrade so I set about doing research trying to find a replacement. I was looking for something powerful to stream some games on, but also light enough that it was not going to feel like a brick next to my Chromebook. Since Linux is my OS of choice, having reasonable Linux support is also on my list of desires. Because of this I wanted to stay away from ATI graphics cards and nVidia cards with optimus. The NP2740 ended up being one of the few pieces of hardware out there that met all my specifications. At 4.2 pounds the NP2740 is just a small bit heavier than my HP14 Chromebook. When ordering from PowerNotebooks.com the hardware also came with a no-OS option. That leaves us the memory and storage space to customize. The memory comes stock at 8gigs, but for my system I opt'd to push the memory to the maximum 16gigs as I knew I would be running virtual machines on my system. Storage space is the one place where the NP2740 really comes out ahead of other laptops in this form factor. In addition to have a standard 2.5" mobile drive, the NP2740 also has an mSATA slot that you can add an SSD to. Personally I have a 240gig, Intel 530 SSD in my unit. On a system this powerful I never expect a reasonable battery life, so I was fairly surprised with the NP2740. When under a constant heavy load (virtual machines running, code compiling, audio going) the battery in the NP2740 lasts for just under three hours. While doing light office work that life extends to around five hours. In terms graphics performance I must say I have been thoroughly impressed with the Intel Iris 5200. For specifics on performance you should see the benchmarks here, but I will say this little card has handled everything I have thrown at it - including streaming some of those games using OBS. Most importantly - the cooling on the laptop is excellent. I can use the device on my lap for hours without any discomfort from heat discharge. Starting with Ubuntu 14.04.1, all of the hardware on the Sager NP2740 is functional by default. If you are using an older Linux distro the RTL8723BE wireless chipset might give you some trouble, but there are workarounds. Because the graphics chip is Intel based you should have full 3D support with the open source drivers present on most Linux distros. Best of all is that I was able to get the hardware with no OS pre-loaded, so I did not have to pay a premium to get a copy of Windows with my new laptop. I always do a lot of research before making a large purchase and I must say that even after days of research the NP2740 blows all the other competition away. Even with my wife's company discounts, other brands such as Dell, Toshiba, and Lenovo could not come close to the $1,300 I ended up paying for the NP2740. You can configure your own starting just under $1,000. All in all I have been very happy with my Sager NP2740. If you are in the market for a Linux PC that is portable, but does not sacrifice performance - this might just be the laptop for you. I am what you could call a practical free software advocate. This means that while I love open source software and everything it stands for, at the end of the day I really just need a computer that works for the tasks I need accomplish. Most people in the world are exactly like me, except they don't care in the slightest about free software. They just want a computer that works. That is why things like Netflix and Steam officially supporting Linux as a desktop operating system is so important. You will get a lot more users who are willing to try an alternative OS when it does not require them to give up using the services they love to do so. So do me a favor - stop complaining. Every time I see one of these large services start supporting desktop Linux, the complainers come out of the wood work with something else to whine about. With Steam it was DRM in the games that now ran natively. With Netflix folks are complaining about it requiring the use of Google's branded Chrome browser. The truth is, change is gradual, but it is coming. So the next time a major content creator/provider opts to add support for our operating system of choice - lets just say thank you instead of complaining about the way in which they are adding that support. The "year of the Linux desktop" is not something that is just going to magically happen when the clock strikes twelve at midnight on January first. It is something that is going to happen slowly over years worth of time. The addition of services like Netflix and Steam are fantastic wins in this slow change. 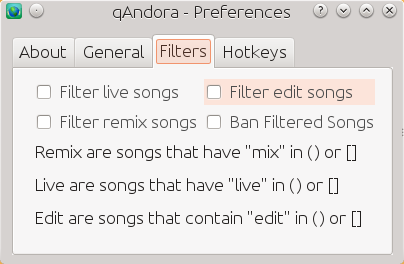 Today I would like to share a simple solution to a problem I have wasted several hours on in the last week: Listening for key presses on Linux using Python. You see, on Windows you can simply use the pyHook library that has existed for years. On Linux no such library is as well documented. After posting my question in several forums I finally was able to track down a reasonable, fairly simple solution. Contained in the Simple Python Keylogger is a pyxhook.py library that is desktop independent and GUI toolkit neutral. One of my goals for this year is to become proficient in a cross platform GUI tool kit. The toolkit I've chosen to get my hands dirty with is Qt because in addition to being cross platform it also has a fantastic amount of documentation. 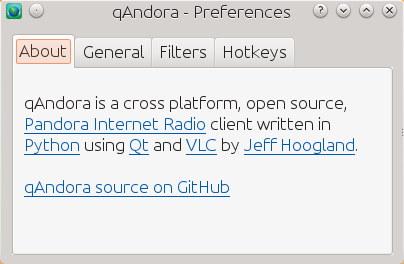 qAndora is a cross platform, open source, Pandora Internet Radio client written in Python using Qt and VLC. If you would like to jump right to giving this little application a try you can find install instructions here. 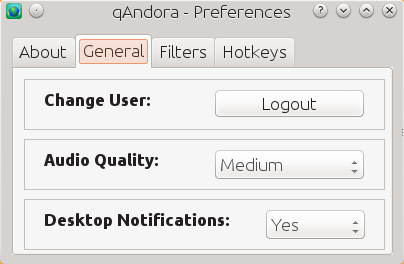 I have tested the player successfully on Ubuntu 14.04 and Windows 7, but it should work anywhere you can install VLC and run Python. If you have any suggestions or feature requests please feel free to leave them in a comment below.